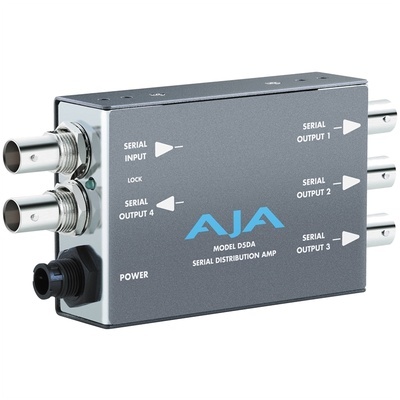 Product #3495 | SKU AJA00020 | 0.0 (no ratings yet) Thanks for your rating! The D5DA is a multi-format, 1x4 reclocking SDI Distribution Amplifier. The D5DA can be used as a low cost SDI DA or repeater. The SDI input is re-clocked and equalized to 300 meters of cable. In addition, the multi-standard feature allows the D5DA to automatically adapt to 143, 177, 270, or 360Mb SDI inputs automatically.